Just when we thought pizza couldn't get any better, this contraption catches our eye. It's the sippin slice pizza flask and it's flippin' awesome. After catching sight of the ooey-gooey cheese and delicious-looking pepperonis, our first reaction was to sink our teeth into the slice. But...psyche! Even though it looks realistic, this is actually a plastic flask. We know, you're as shook as we are. Perfect to give as a gag gift or equally suitable to buy for yourself too, the flask is created from the unique brand, The Cool Quenchers. It may draw attention since it looks like a fresh piece of 'za so be sure to whip it out when you're in private, only. Everyone will want a bite and when they find out its a flask, then they'll want a sip! The triangular bottle is made from hard, molded plastic and features a large pizza sticker on front. There's a screw-on style lid on the tip of the pizza and this is where you put the beverage of your choosing. Please note, this product is hand-wash only and keep it far away from the microwave. 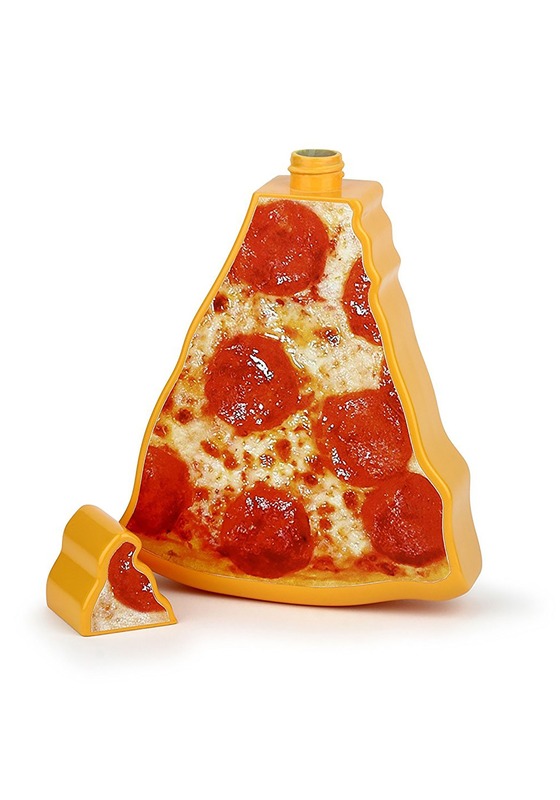 If you love this pizza flask, you'll love our wide selection of uniquely shaped flasks. Check out our donut and banana flask too!